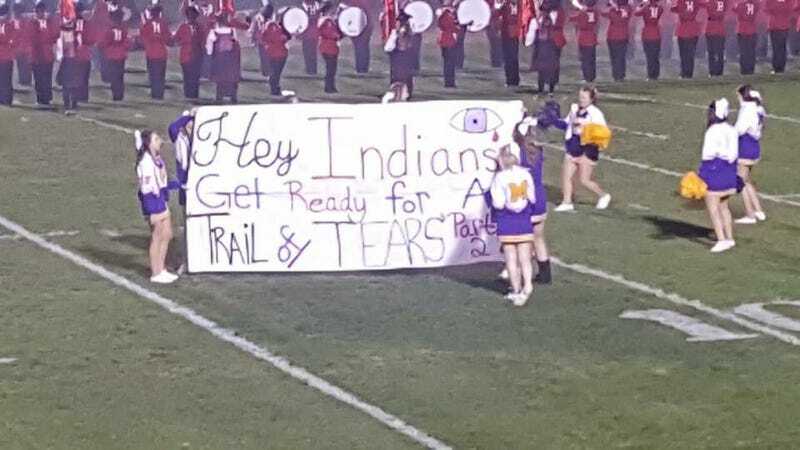 Tonight’s Ohio high school football game between the Greenfield-McClain Tigers and Hillsboro Indians featured this embarrassing banner presented by the Greenfield-McClain cheerleaders, promising a “Trail of Tears Part 2" for Hillsboro. If that weren’t bad enough—and trust me, it is—it was an away game for Greenfield-McClain, meaning they brought this banner to Hillsboro. Hillsboro and Greenfield are rural cities east of Cincinnati, and since it seems they don’t teach history in Greenfield—which, having spent time there, I’m pretty sure they don’t—here is a description of the Trail of Tears, reprinted from Wikipedia under the Creative Commons Attribution-ShareAlike License. The Trail of Tears was a series of forced removals of Native American nations from their ancestral homelands in the Southeastern United States to an area west of the Mississippi River that had been designated as Native Territory. The forced relocations were carried out by various government authorities following the passage of the Indian Removal Act in 1830. The relocated people suffered from exposure, disease, and starvation while on route, and more than four thousand died before reaching their various destinations. The removal included members of the Cherokee, Muscogee, Seminole, Chickasaw, and Choctaw nations. The phrase “Trail of Tears” originated from a description of the removal of the Cherokee Nation in 1838. Between 1830 and 1850, the Chickasaw, Choctaw, Creek, Seminole, and Cherokee people (including Native Americans, and the African freedmen and slaves, who lived among them) were forcibly removed from their traditional lands in the Southeastern United States, and relocated farther west. Those relocated were forced to march to their destinations by state and local militias. Update (Oct. 29, 9:49 a.m.): An apology was apparently posted to Greenfield-McClain’s Facebook page, before later being deleted.